I am a member of a global advisory group with an international Christian organization. From time to time, I will contribute facts, ideas, and opinions to some of the most pressing issues surrounding the Christian Church and faith matters. This week, the question is: "Why Young People Leave the Church and How to Stop it?" An accompanying article points a finger at two main reasons: 1) The young has never really been challenged in their faith; 2) They have not seen authentic discipleship done among adults in their churches. I am not entirely convinced. With that, I want to do some exploration of what others are saying before I offer some of my thoughts. A) Why Millenials Are Leaving the Church? Recently, popular blogger Rachel Held Evans wrote a provocative article entitled "Why Millenials are Leaving the Church." In it, she explained some of the expectations of Millenials (those born between the 1980s and 2000s). They are people who prefer to be a class of their own, and not straitjacketed into any categories others want to impose on them. They are people who insist on equal rights for all, including the LGBT community and other marginalized groups. They are people who ask real and hard questions and expect their questions to be taken seriously. They want answers that can be answered as fully and as respectfully as possible. All of these are suddenly flushed down the toilet with a condescending comment from a pastor that misses the point. She writes: "What millennials really want from the church is not a change in style but a change in substance." Such a stance has also encouraged Evans to be more open to the high Church tradition, manifested in "Catholicism, Eastern Orthodoxy, the Episcopal Church," and so on. Point noted. Yet, what makes the whole article so interesting is not the article per se, but the responses that it triggered. Within the first week, there were more than 100000 social media reactions to that piece. It seems like everyone has an opinion on the Millenial question. Some of the comments use the article as a launchpad for their own ranting about the ills of the existing church. That is indeed very sad. I am a parent of Millenials. They too have complained to me about feeling disconnected from Church. On the leadership front, there are people in churches who have tried very hard to make things work for the Millenials. Unfortunately, the good efforts do not even scratch the surface of the problem. Churches that try to dress up their church activities for the young, are at best connecting only a superficial level. I know of one Church that had invested in a brand new gymnasium, filled with pool tables, games, computers, cafe corners, and things that seem to be of interest to the Millenials. After a few weeks, these young people became bored and no longer seemed to be as interested. So, Evans is correct in saying that it is not "style" but "substance" that matters. 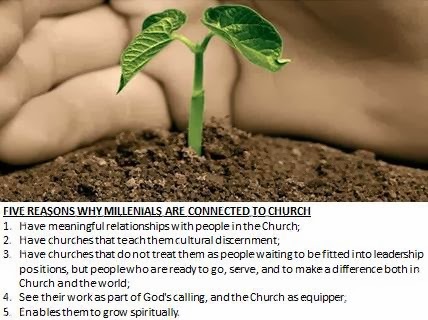 B) Why Millenials are Connected to Church? Enables them to grow spiritually. Krish Kandiah, Executive Director of Churches in Mission and a regular Summer School lecturer at Regent College also begins with a concern for the exodus of the young. In "Doing Discipleship Differently," Kandiah first notes that churches have failed to disciple people for the whole of their lives. As a result there is a double negative impact: the young leaves, and the church remains ineffective in its cultural impact. He laments the lack of unity in churches and the four popular models in which discipleship has been done. Let me paraphrase it. The first model is the individual devotion method. Here, churches teach members to retreat from the world through solitude and the spiritual disciplines. The second model is less individual but more community, but still maintains a focus on retreating from the world. In other words, this model is simply doing things together rather than learning things individually. Small groups working on a spiritual discipline together is one example. The third model focus on equipping individuals with an eye on their vocations. In doing so, the belief is that members will then make a larger impact on the world. The fourth model aims at missional living, to be incarnational in all we do in our neighbourhoods. This model is largely focused on social justice matters, giving to the poor, helping the needy, and other charitable causes. Kandiah's approach to discipleship is one that is "multigenerational, multiclass, and multicultural discipleship." Kandiah has a point, but his suggested approach needs more meat in order to be clear and effective. As for me, I find Rachel Held Evans approach too combative. Judging from the active responses to her article, her article works like a heated knife cutting through butter and dividing the Christian community farther apart. The Barna research article holds more promise but lacks specific usefulness for individual church communities. In other words, as long as the statistics are mere numbers, anyone can say the numbers do or do not apply to them. It is a helpful overview of the Church at large, high in general description but low in specific prescription. Frank Nolton's conclusion of the two key reasons for the exodus of the young appears to be high in general observations but low in specific applications. Kandiah's take on a different kind of discipleship has good promise but lacks details. Throughout history, great revolutions and movements are often a result of reactions against something. For instance, the Great Schism that splits the East and West is a reaction from the use of icons in the Church. Influenced by Islam's ideological rejection of images that depict the Divine God, Pope Leo III issued an edict against the use of icons in the Church in AD730. It caused a counter reaction against the order to destroy all images and Church symbols which split the Eastern Church. Called the Iconoclastic controversy, the Churches split on the basis of the acceptance or the rejection of icons. There is the familiar Reformation led by Martin Luther against the ills of the corrupt Roman Catholic Church in the 16th Century. This too is a reaction against the excesses of the Roman religious empire. In England, we read about the Great Awakening which is in essence a reaction against the social ills at that time. Led by George Whitefield and John Wesley in the 18th Century, we see how the Protestant movements get revived, and a powerful work of God ensues. The 20th Century is well-known for the Pentecostal and Charismatic movement, which is a dramatic reaction against the spiritual lethargy of many mainline Protestant Churches. More recently, Francis Schaeffer, Billy Graham, and Rick Warren lead the evangelical movement, which in itself is a reaction against liberal Christianity. If I follow the pattern correctly, our current problem with the youths has something to do with a reactor factor. The Millenials are reacting against something in the Church, and most are staying quiet about it all. A rising number are making their views heard. Churches that have anticipated the trend will have adjusted their sails accordingly. In other words, while I agree with the Barna article about being connected, I think staying connected is only half the story. For Millenials to be a part of the Church, it is more important that they not only feel connected, but they want to be connected more and more. For this to happen, the Church must take the initiative. Don't wait for them to connect. Connect with them now. We need to discover their reactor factor. Ask what they are reacting against. Ask what motivates them. 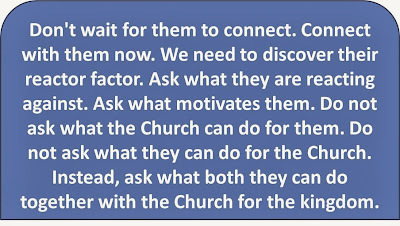 Do not ask what the Church can do for them. Do not ask what they can do for the Church. 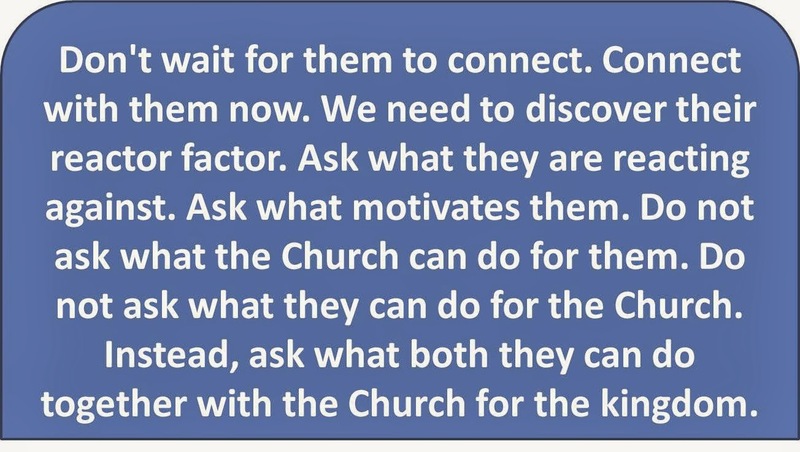 Instead, ask what both they can do together with the Church for the kingdom. Good understanding is already half the battle won. The other half is about adjusting our sails constantly to catch the winds of change. People by nature will react once a limit has been breached. Churches that recognize this threshold have at least three choices. Recognize it from far; Respond to it up close; or Ignore It. My suggestion: Churches need to be open to adopt all three options. The first option must be to recognize that the problem is real. Recognize that the Millenials have special needs different from the rest, and that they must be given more credit than simply the recipients of any blame game. Recognize that ministries must be prepared to change the style but not the substance. The second option is an important one. Respond to the changes as much as possible. There is no better way than to invite Millenials into leadership boards as soon as possible. Ideally, I like to see at least half the leadership from the Millenial group. Let them lead more and more, while the more experienced members participate in mentoring them and discipleship matters more and more. The final option of ignoring it may sound a little strange. I want to make a disclaimer. This final option is primarily for churches that have already lost their Millenials. By "ignoring it," I mean not crying over spilled milk. There are churches that need to start from scratch. They must learn not to let the past hijack their efforts to start afresh. They need to start seeding, even with 1 or 2 individuals. Ignore what has been past and gone, and re-start the whole planting and cultivating process. We all make mistakes. All churches do. Those whose new wine has burst their old wineskins must start again. It is ok to make mistakes, as long as we all learn from it. Recognize that the Spirit of God often moves in spite of our weaknesses. All movements come about after long periods of accumulation of discontent. There will come a time where a new movement will spark a brand new wave of revival. This is the reactor factor. We must prepare for it. Read the signs wisely. Prepare our people properly. Anticipate the Spirit's work surely.